THE STUDENT OF PRAGUE (1913 original). This spooky 1913 story was billed intriguingly as a four-act ‘romantic drama’, heavy in atmosphere and a typically committed, high-voltage (dual) performance by Paul Wegener some years before THE GOLEM made his name internationally in the Expressionist era. There is a rather nice, ornate device at the beginning introducing us to each of the principals whereby a theatrical curtain is opened revealing each actor in isolation striking a characteristic pose (almost a reverse curtain-call), including Wegener wielding a rapier and Grete Berger as the Countess reclining decorously on a chaise-longue. Wegener is Balduin, an impoverished student who is offered a peculiar deal by an enigmatic old gentleman, Scapinelli (John Gottowt), whereby he agrees to sign a contract giving him one hundred thousand gold coins in return for whatever the old man chooses from his room. Balduin readily agrees to this insanely easy bargain. What he could not know is that it is a trick. To his amazement, Scapinelli hijacks Balduin’s reflection from the mirror, stealing his soul in a sense. The doppelgänger walks out with the gloating old man. Balduin’s confusion though is soon overtaken by his own pleasure at the money. Balduin courts a beautiful Countess whilst his double haunts him. His twin makes him life a misery, going so far as to use his legendary swordsmanship to kill a another man in a dual, a close relative of the Countess, who the real Balduin had sworn to leave alive. A card game with friends is taken over by the double goading Balduin to play against himself. 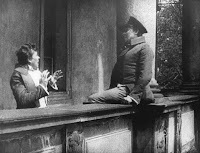 Driven half-mad, the student secretly climbs the gate into the Countess’s grounds, taking a ladder up to her room, begging her forgiveness for what was done in his name and professing undying love for her. They kiss just as the reflection appears again, mocking him imperiously and frightening the Countess with this terrifying dual image. Balduin flees, yet no matter where he runs to, his double follows – “Wherever you go, I’ll be…” Finally, the strain is all too much and the student dies, leaving the sorcerer Scapinelli to tear up the contract in macabre glee. The last shot is the doppelgänger sitting on Balduin’s grave, staying at his last resting place. THE STUDENT OF PRAGUE is entertaining and spirited, whilst making picturesque use of its location work. 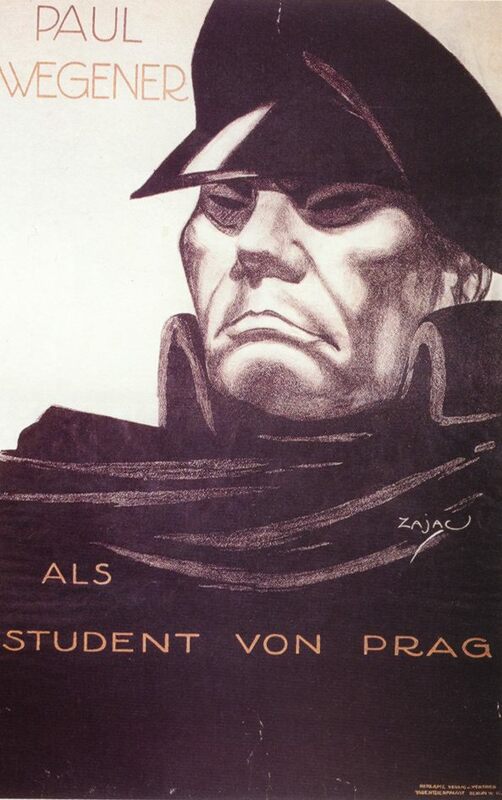 THE STUDENT OF PRAGUE (1926). 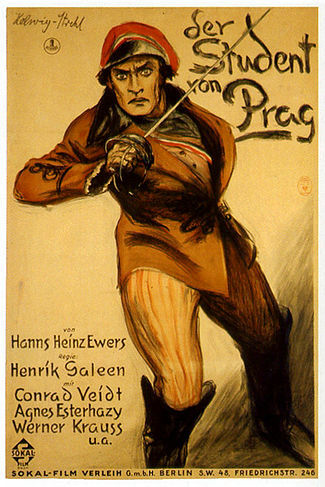 The same week that THE MAGICIAN was released came this remake of the 1913 Paul Wegener film starring Conrad Veidt as perhaps a more convincingly youthful student (Balduin) in what is widely regarded as the superior version – despite the poor quality of the print I could find. By casting Veidt and Werner Krauss together as hoodwinked victim and respectively the mesmerising sorcerer Scapinelli, writer/director Henrik ‘THE GOLEM’ Galeen was able to recapture something of the servant and master relationship dynamic they had in THE CABINET OF DR CALIGARI, though here we have the more personable side of Veidt to offset his disturbing ‘mirror image’. The 1926 remake features stronger character details enabling you to care more about them, a vital ingredient if we are to be absorbed in the story. The introduction establishes up-front that this will be a tragedy by actually beginning on the student’s tombstone which reads: “Here lies Balduin – He fought with the devil and lost”. We see more of Balduin’s prowess as the greatest of swordsmen in the opening when he takes on all-comers in the tavern in swashbuckling style. 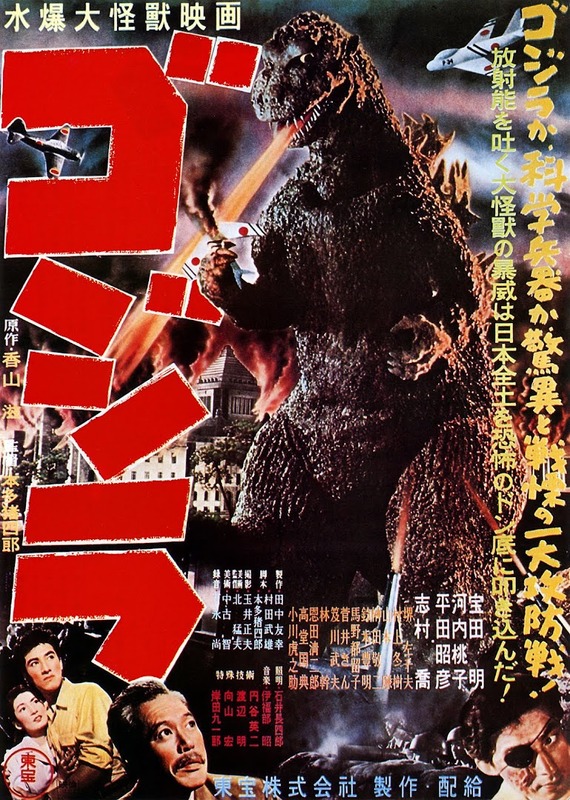 This bravado also contrasts well with the crushing weight of his impending doom upon him once his contract with Scapinelli materialises his murderous double (See 1919 review). We are led to care more about the flower-seller and her unrequited love for Balduin that causes her to betray him. There is the powerful sequence during the fox-hunt showing Scapinelli’s long-range influence ‘conducting’ the flow of horses and dogs like an occult puppeteer, leading Balduin to save Countess Margit when she falls from her horse. Also, when his ‘second self’ commits the murder of his duelling partner that the real Balduin swore not to do, instead of the 1913 Wegener double’s matter-of-fact reaction, here Veidt’s doppelgänger takes a moment to gravely register the committed murder. Ultimately, Balduin faces off against his mirror image in the very mirror from which he was extracted. He shoots the glass in his frenzied state, and as he studies his reflection in the shard, his spirit seems to splinter too and he dies, leaving us a closing shot that returns to his tombstone where we began. Fans of silent horror films may prefer this version to the 1913 original and see how its performance style fits neatly as well into the Expressionist era.